Benchwork. The Great Stress Reliever! I've just gone through 5 days of hell. The people who my webhoster rents server space from in Chicago defaulted on Tuesday last and walked away without telling anyone. So I and many others were left without websites and email for days as a result. Email service was restored Saturday am, but due to some errors in passwords the websites are still not back up at this time. Also, due to some other errors yet to be fully understood, my email backups are not 100% at this time. I've lost about 200 emails, but I'm hopeful that I can get some of it back yet. So I decided to distract myself and get some layout work done. Namely a little bit of roadbed. Nothing fancy. Just a run of mainline from the west end staging, around the corner where "Skunk's Misery will be, and as far as the west end of the Kettle Creek steel trestle. I can't really proceed any further now until I dig out the box that has the abutments and the trestle footings so I can determine how far below the regular benchwork the valley floor has to be. None of this has solved my web issues, but I feel better, a little. I'm trying something different for me this time around. I drew a rough scale plan of the St Thomas yard, based upon the survey that I have. From there I drew the yard out full size on kraft paper on the floor. I knew that things weren't going to be exactly as I had drawn in the scale plan. Turns out I was right. A few things had to move. It's astonishingly tricky trying to condense a 700' yard into a 25' space. Lot's of give and take. And a few hard choices. To retain the signature elements I had to give up a few items. Swift coal dealer had to go for aisle width. A couple of OCS tracks in the yard were deleted as I ran out of space. The 2 legs of the wye, again for space. (That one was easy to let go of). I may model a face of the freight house and the station. That remains to be seen. But I have enough length in the caboose tracks for 16 cabooses, which seems about right. I also got to lengthen the steel viaduct at the west end by another tower, which will only serve to make the whole thing more imposing. I'm going to leave the drawing on the floor for awhile and stare at it on and off for weeks to make sure I'm happy with it. In the mean time, I can and did build some basic benchwork from the staging yard into the first 180 degree turn which will bring the main into the yard. Benchwork is straight forward. My favorite framing material, finger jointed pine, ripped into 1x3 with simple legs. Screwed together and secured into the walls as well. Roadbed will be 5/8" fir plywood. I can't find my preferred 1/2" poplar ply in town, but the fir will be stronger and the thickness will be consistent over the time it'll take me to build the layout, I'm sure. This bit here is where the caboose pocket will be. An area that used to be known as Skunk's Misery. Would love to know the history of that one. And Homasote has been found! Here are the 5 reefers I discussed in an earlier post, all done, weathered and ready to be packed and shipped. The colour variations I played with are subtle but there. All were weathered with a combination of Pan Pastels and oversprays of thinned grime, mud and grimy black. All were initially given a wash of india ink heavily thinned in alcohol. I'm very pleased with the final result and I'm sure the client will be as well. If you`ve been trying to email me or visit either of my websites you`d be forgiven for thinking I`ve dropped off the face of the earth. The reality is that my webhoster is having issues with the people he rents server space from. 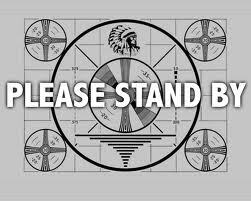 We are hoping to have normal services restored soon. Oh yea, I remember now. While the paint cures on the reefers, I thought I'd shift gears somewhat. A friend asked me to build him some code 55 #5 turnouts using the Fast Tracks system. So today's the day. I dug out the tools. Found them in the first box I looked in. Must be a sign. I sat down, looked at the fixtures and the filing aids and found myself wondering, " How did we do this?" It's been 3 years at least since I've built a turnout. Good thing that the system Tim Warris developed is so good. It all came back pretty quickly. Can't wait until I can do this for myself. I'm currently in the midst of building a quintet of PFE reefers for a client. They are all older Sunshine kits, that are a delight to work with. Long time readers will know that I am a firm advocate of flat cast parts for reefers. Not having to mask the ends and roofs and underbodies greatly eases the tasks of finishing these cars and I can maintain superior demarcation lines between the colours. There were 2 things I wanted to really strive for on this build project. One was a better colour match for PFE orange. The other was some subtle variations in the car colours to reflect weathering effects. I explained to Tony what I was trying to do and how I felt the "reefer orange" was not right. And what would he suggest to use. Tony informed me that SP Daylight Orange and the PFE orange are in fact the same colour, it's just that the use of that colour by the PFE pre-dates the use by the SP by about 6 years. Hello Scalecoat, send me some Daylight Orange! Now for the faded tones. I've never had good results adding white to any colour to reflect fading. In boxcar red tones things go pink very quickly. So I experimented with something I had heard about. Use grey. Which I did. And I'm very pleased with the results. I also did a 2 sets of sides with Daylight Orange and added a touch of C&NW yellow, to reflect sun bleaching. Which also worked out well, I feel. So here they are. One set of sides, straight Daylight Orange, 2 sets with grey added and 2 sets with yellow added. So far I'm pleased. Once the cars are assembled and weathered, I think they'll be real standouts. After a brutal 13 hour drive home from a very successful RPM in St Louis, I felt that a little me time was in order. With the plan being to feature the St Thomas yard in the new layout, it was clear that I needed a "Tilley". Tilley is, (she's still running at the Elgin County Railway Museum), the little 43 tonner that was purchased by the Wabash for switching duties in the yard. The closest model out there is the Bachmann 45 tonner. Though there are many detail differences, the salient features are there for. It's tiny, centre cab, side rod connected drivers. I bough one online, painted it black. Added lettering and then today I installed the decoder and speaker. Yes that's a quarter in the foreground. The Loksound decoder just fit in the space provided, and check this out. The clever souls at Bachmann provided space for a 1/2" dia speaker. All it needs now is a little paint touch up and some weathering. Oh and a layout to run her on. Nothing says layout room like sky blue walls! As you can see the ceiling tiles are all in, as are the new fixtures. But the beige paint had to go. For this iteration we chose "Wash and Wear" at the Home Hardware for wall colour. I like it. I may use a different shade once the layout gets underway, but this'll do for now. I plan to add "backdrops" to the back of the benchwork as I go along, but not to the ceiling. To just above eye level. That'll keep the space a little more airy and allow better air flow. You can also see that I've created my first bit of benchwork. 16' long by 16" wide bit for the west end staging yard. Room for 8 long tracks. I'm trying for 14' long trains. It'll become clearer why in the future. 14' will allow for about 25 40' cars, plus a caboose and 2 F7s. Not a bad representation of a Redball, which were usually twice as long. And I've decided upon benchwork height. 48". It's a nice height for me. I can reach in when I have to. There will be a couple of deep scenes as the yard develops. Access is always important. Right now I'm fiddling with the yard ladder, trying to decide how best to lay it out and not loose precious length. Pretty sure a compound ladder is in the offing. Sometime in the next few weeks, Trevor will be back and we'll be crawling on the floor drawing the St Thomas yard onto Kraft paper to make sure it can fit as we think it will. The next dilemma is going to be Homasote I fear. I have to contact the wholesaler in London to see if I can get a few sheets without buying a full lift load. The local lumberyards don't stock this item anymore. Not looking forward to having to find alternatives.